Riggins has always worn a doggie seat belt. When he was a puppy I had a truck and a seat belt was necessary to keep him off my lap and in his seat (vs out the window) while I was driving. Since he doesn’t know any better, he has no problems wearing his seat belt and the few times I allow him in the car without it he doesn’t quit know what to do. Normally he will sit back as if his seat belt is on. He will stay there until we go through a drive thru and then he will balance his front paws on the middle armrest thing. You can see him pondering how he can get from that position, over me, out the car window, and into the food window without anyone noticing. All those enticing smells so close and yet so far away. I am actually surprised he has never tried it. If he doesn’t have his seat belt on (which happens now and then when we drive somewhere to go for a walk and he has his walking harness on instead of his seat belt) he will refuse to get out of the car until I “unbuckle him” (see video below). I can stand there all day and tell him that he is free to move around but he won’t go out that door until I lean down and free him from his nonexistent restraints. Silly dog. I’m often shocked at how many dogs don’t wear seat belts. It seems like common sense right? 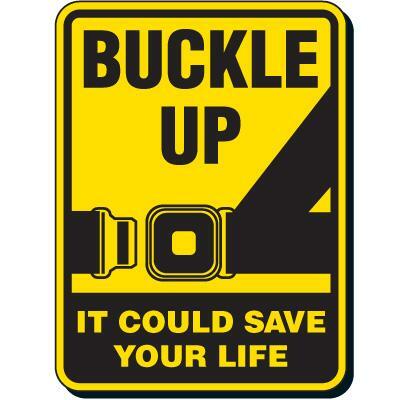 You buckle in. You strap you kid down. Why not your dog? I don’t understand how people can safely drive with a tiny dog hanging out in their lap and if you have a big dog, one collision and that dog is flying over the seat and taking off the head of anyone in his/her way. Ouch for the dog and ouch for any person in the dog’s flight path! 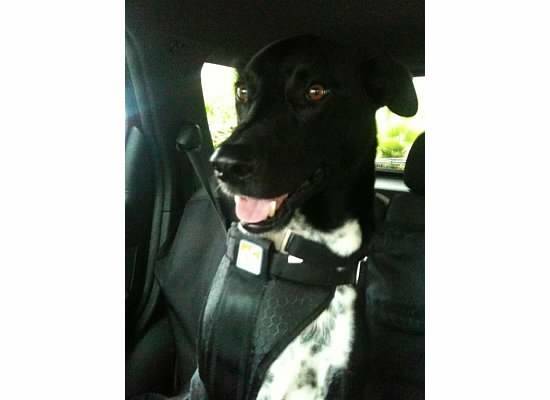 Dog harness – This is the type of seat belt Riggins uses. There are different brands but they are all similar. It is essentially a harness with a double loop in the back for you to stick the seat belt through. In addition to that, this version (that I linked to) has an extra attachment that is a longer loop which gives the dog more freedom. I don’t use the longer loop on Riggins. It isn’t necessary and frankly it is just more work for me to take that on and off. This is the harness you see on Riggins in almost every Runyon picture of him. When we go hiking I just take off his leash, wrap it around my waist, and leave the harness on. It also gives you an easy to grab “handle” if you need to grab your dog while you are out and about. Seat belt connector – This is the same idea as the harness Riggins uses it just allows you to make any dog harness a seat belt. Pretty nifty. 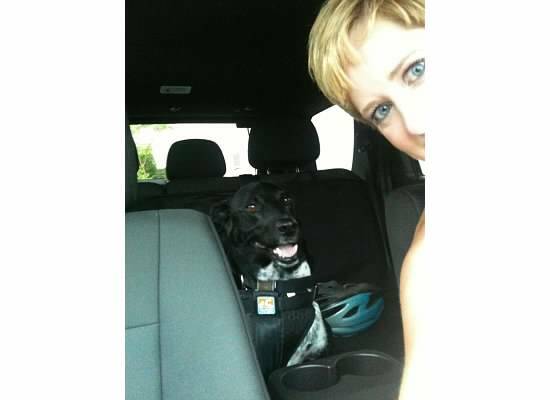 Zip line – Some car seats aren’t very dog friendly. This is true of my folks car. The bench seat is way in the back and Riggins prefers to be up near the action. The middle seats are bucket seats which Riggins can’t really sit in well. I bought them the zip line. It goes across the length of the car overhead (attaching to the handles on each side) then you hook the dog to that (they usually come with a short loop leash to make this easy). I don’t like this restraint as much simply because it isn’t much of an actual restraint. The dog has the freedom to pace back and forth if he/she wants. The plus is because of the increased freedom, it is a good solution for dogs who aren’t “comfortable” in the harness seat belts. Booster seat – For smaller dogs they make booster seats (hilarious right?). These not only allow you to seat belt your dog into the chair it brings the chair up so your tiny dog can have the luxury of looking out the window (not all are up in the air like the one I linked. Some sit on the chair and have pillows to help boost up the pet). Obviously Riggins has never required a booster so I don’t have any experience with any of the booster models. My friends who use them love them. Pet partition – I’ve never used these. I have too many things in the back of my car. Dogs don’t fit. BUT … if you dog does ride back there the partition keeps him/her safely in that area. Cage/carrier – Finally, if you are a monster, you can put your dog in a cage while you drive. If you take your dog in the car give a restraint a try. It’s safer for your dog (and your human passengers) and makes you a very responsible dog person! What a good Riggins! What a good mommy.